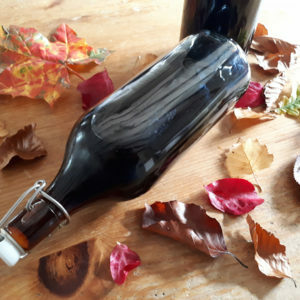 We love homemade gifts and recently one of our lovely friends made us some non-alcoholic ginger wine. The thoughtfulness, time and effort that goes into homemade gifts matters more to us than the end product. You know that someone has dedicated their time and effort into making something for you, with love and patience as their intention. It doesn’t have to be big and you don’t have to be an expert craftsman to make someone feel loved. At this time of year, a sweet warming drink is perfect after we’ve been outdoors for a few hours. Robson’s Ginger Wine (made in Chester-le-street, Co. Durham). Lucky for us Emma has the Robson family recipe! Top secret I am afraid, but it is pretty awesome stuff!